Ranulph Higden (d. 1364), was a monk of the Benedictine abbey of St. Werburg, Chester. His 'Polychronicon' is a universal history, based on earlier writers, but extended down to his own lifetime. As it was the most complete such work available in the 14th century, it enjoyed considerable popularity, being translated into English in the late 14th century, and printed by William Caxton in the late 15th century. This manuscript has the ownership inscription of John Wardeboys, who was abbot of Ramsey at the time of its dissolution in 1539. 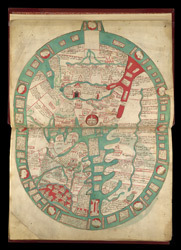 This page contains the right half of a map of the world. England is to the lower right side, with a red background. Fourteen cities are represented and identified, including London, Winchester, Lincoln, Oxford, Worcester, Gloucester, Norwich, Northampton, York, and Exeter.